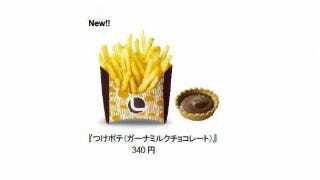 Lotteria, the most bonkers fast food chain in Japan, is rolling out its latest unusual meal: French fries with chocolate dipping sauce. Hell, why not? I'm game. In Japan, chocolate-covered potato chips have started appearing in supermarkets and convenience stores in the past few years. They're still somewhat of an odd product, but there are those who love the salty-sweet combination. Starting January 9, Lotteria is rolling out "Dipping Fries" with Lotte's Ghana-branded milk chocolate. The fries are priced at 340 yen (US$3.30) an order and will be available in Japan until late February.